St. Mary's Beenham is situated down the lane opposite the school. There has been a church on the site since medieval times, although it has burnt down several times in its history. The present building dates from 1859, designed by Henry Woodyer and exhibits a mixture of architectural styles. Services on the 5th Sunday rotate around the Benefice. To download or view the Church Magazine online, click here. Coffee is served after every service. 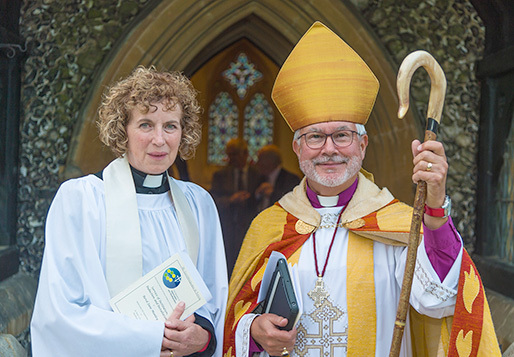 The Rector: Rev Jane Manley was licensed at St Peters church Woolhampton, on 6th September 2018, in a service led by the Rt Rev Andrew Proud, Bishop of Reading. Jane was born and brought up in Zimbabwe but has lived in England since the early 1980s. She was ordained at Christchurch, Oxford, in 2008 and has since served in Bracknell, Crowthorne and London, where she was also Dean of Women. Revd Janice Macdonald, Curate in the Aldermaston and Woolhampton Benefice, was ordained priest at Reading Minster by the Rt. Revd. Andrew Proud on Saturday 25 June. Janice began her journey to Ministry within the Aldermaston team as she explored her vocation to the priesthood over many years and will continue to serve the people of her home Benefice. A packed service took place in the Benefice on Sunday morning at St Peter’s Brimpton as Janice presided at her first Holy Communion. She will work alongside the rest of the ministry team as she continues her Curacy. Rev'd Janice pictured after the Ordination service with the Rt Rev'd Andrew Proud, Bishop of Reading. Pictured left, Andrew, Bishop of Reading, with Rev'd Pat Bhutta at St Peter's Church, Woolhampton on 6th November 2013, when Bishop Andrew led a service to licence Pat as Associate Priest of the Benefice. In 956 A.D. Beenham was called Beena's Hamme, or Benna's Meadow. Although Miss Sharp's “History of Beenham” states that it is a mistake to apply the name of ‘valence' to the parish, it is nevertheless so titled in all the Ecclesiastical Deeds, Documents and Diocesan records. The vicars have always been and still are inducted and instituted into the parish of Beenham Valence. The word Valence is reputed to mean ‘on the spur of a hill', and the setting of our church certainly bears that out. The original estate of the Manor of Beenham stretched from Bradfield to Aldermaston and Woolhampton. The estate was obviously very ancient — on an early tapestry map, now in the Victoria and Albert museum, there is a small stockaded house where Beenham House now stands. Formerly the site of a preaching cross, a church was first built on the present site shortly after the Norman Conquest. Ancient and interesting tombstones stand close by the south porch. The earliest reliable records show the grant of the Church and Manor of Beenham to the abbot and monks of Reading Abbey by Henry I. The abbey held the Manor and the Living until Henry VIII's dissolution of the monasteries. In 1538 the Archbishop of Canterbury, Hubert Walter, confirmed this gift to the ‘Church of Reading'. The Living passed initially to Sir Henry Norreys of Roycote, and is now with the Trustees of Keble College, Oxford. The Living was presented to Thomas Stackhouse in 1733. He wrote his famous ‘History of the Bible' not at the vicarage, but at Jack's Booth (now the Spring Inn) on the Bath Road. He often went there on Saturday nights, drank deeply and preached on the sin of drunkenness the next morning. The earlier church was destroyed by fire and rebuilt in 1794. This church was also destroyed by fire and in 1859 Henry Woodyer, an important nineteenth century architect, built the modern church. This incorporated the 1794 tower, which is of brick with stone dressings, whilst the rest of the exterior is of flint with stone dressings. The roof is tiled with a catslide over the nave and aisles, which, despite having been built so recently, are in thirteenth century style. The chancel was added in 1871. The church has a ring of six bells dating back to 1859. Although these have been refurbished and rehung several times, they are the original bells. The bells from the earlier church were melted in the 1794 fire, but the parishioners collected the molten metal from the churchyard and managed to reduce the cost of the new bells from £393 7s. 6d. to £154 4s. 0d. In 1936 Death Watch beetle was discovered in the timbers of the tower, but after the bells were removed and rehung in a steel frame, they were first rung for the coronation of King George VI on 12 May 1937. Miss Mary Sharp of Ufton Court painted the murals in the nave of the church with the assistance of a London painter. Two of the frescos have her signature and are dated. They form narrative panels with the subjects: Expulsion from the Garden of Eden (1876), The Sacrifice of Isaac, The Prophet Jonah, David as a Shepherd (1882), Jesus among the Doctors, St John the Baptist, The Adoration of the Magi and The Annunciation. Above many of the paintings are corbels decorated to integrate with the mural. In contrasting style, in the sanctuary, Mary Sharp also painted The Last Supper (1879). Restoration of the murals was completed in two phases during 1998 and 1999. The subjects of the stained glass windows are as follows. The west window shows Christ the King, surrounded by Apostles and Angels, with St George at the base of the window. The east window shows The Ascension of Our Lord and the window on the south side of the choir portrays the Baptism of Jesus in the River Jordan, the Transfiguration with Peter, James, John, Moses and Elijah, Christ praying in Gethsemane, Bearing the Cross, Preparation for Burial in the Sepulchre and finally The Risen Christ. Two separate stained glass windows at the rear of the church were broken beyond repair by burglars in 1989 and 1992. The organ is that originally installed in the organ chamber of the church in 1867. It was renovated in 1874 and had two new Bourdon pipes added. It was enlarged in 1898 and again in 1914. Electric light was installed in 1933. In 1936, two Gurney stoves were installed to heat the church. Although no longer in use, the flues having been removed, the stoves remain in their original position in the church. In 1996, during restoration work to the wooden parts of the floor, several tombs were discovered, in particular, three inscribed limestone slabs. The locations of the Carter and Bostock family vaults were confirmed. In 1988 the Archbishop of Canterbury, Robert Runcie, celebrated Holy Communion and preached here. A photograph of his visit can be seen on the wall at the rear of the nave. In 2003 the cabinet in the north aisle was donated by the History of Beenham Group to house two volumes of Thomas Stackhouse's History of the Bible. 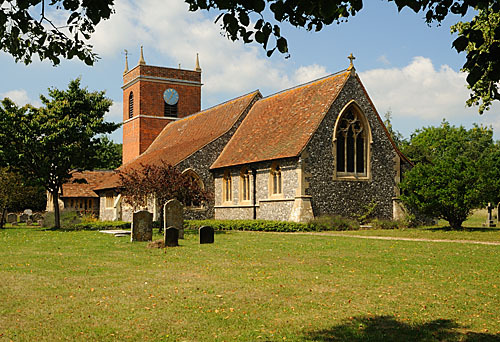 St Mary's Beenham churchyard is being managed as part of "The National Living Churchyards and Cemeteries Project". Churchyards are important havens for a wide range of insects, birds, mammals and plants. Appropriate management will vary, but in most churchyards managed for conservation you will find areas left unmown for part of the year to allow plants to flower and set seed, plus other special features with wildlife in mind. Our churchyard management plan was drawn up with the help of conservation experts BBOWT (Berks, Bucks & Oxon Wildlife Trust) and is available for inspection in the church porch. 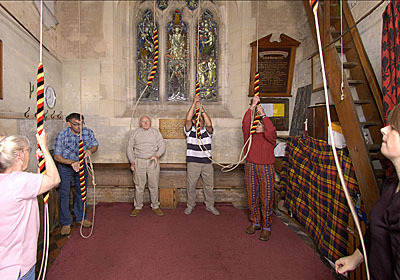 Bell ringers meet every Tuesday at 8.00pm at St Mary’s Church. Beginners are very welcome. Although there is no Roman Catholic Church in the Parish, Douai Abbey is a Roman Catholic abbey and church situated on Cods Hill to the west of Beenham.